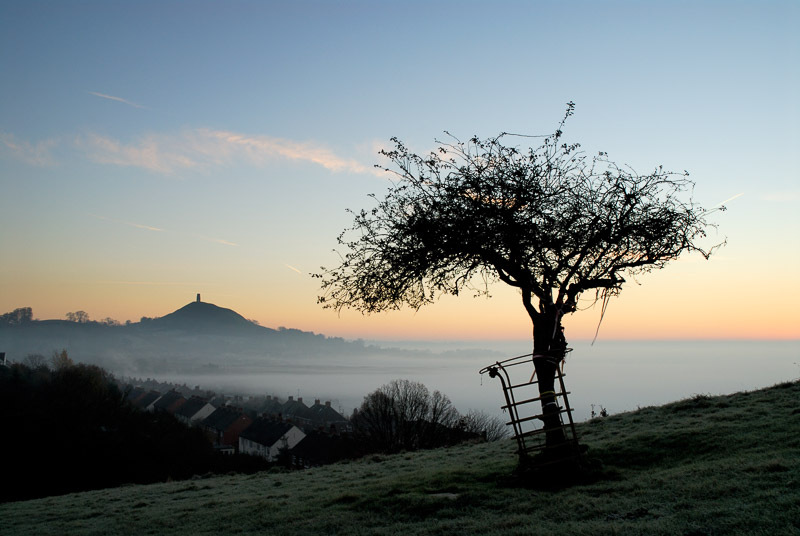 Glastonbury Tor and Holy Thorn at sunrise in winter. Unfortunately this view of the Holy Thorn tree at the top of Wearyall Hill was diminished by vandals who cut the top off of the tree. I captured this image in 2007 on a very frosty morning when fog was shrouding the fields around Glastonbury Tor. Just before the sun broke over the horizon the light was wonderful and the tree appeared as a silhouette against the cool sky. A foggy sunrise over the Somerset levels. 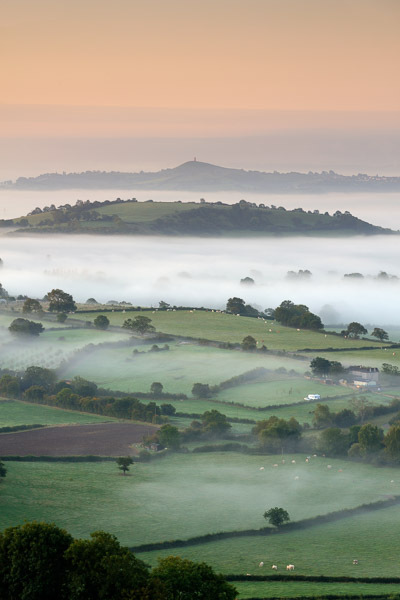 Several miles north of Glastonbury is a spot on the Mendip hills known as Deerleap. It is well known by local artists because of the far reaching views it provides over the Somerset Levels and of Glastonbury Tor nestled in amongst the hills. On misty mornings it is the perfect spot to appreciate just how flat the landscape is and how it would’ve looked thousands of years ago when the area was under water. On mornings like this it becomes an island once again. The morning on which I made this picture was quite special. Having witnessed the misty landscape from Deerleap many times since, I haven’t yet photographed it on another morning where the mist was in the right place. By this I mean that it wasn’t too thick or too thin. When it’s too thick Glastonbury Tor becomes a dot in a sea of white with all other landmarks shrouded in mist. When it’s too thin the ‘island’ effect isn’t as pronounced and much of the atmosphere is missing. The way the mist gradually thickens as it gets closer to Glastonbury is wonderful. I have since made other panoramic pictures with a similar composition but this is my favourite. 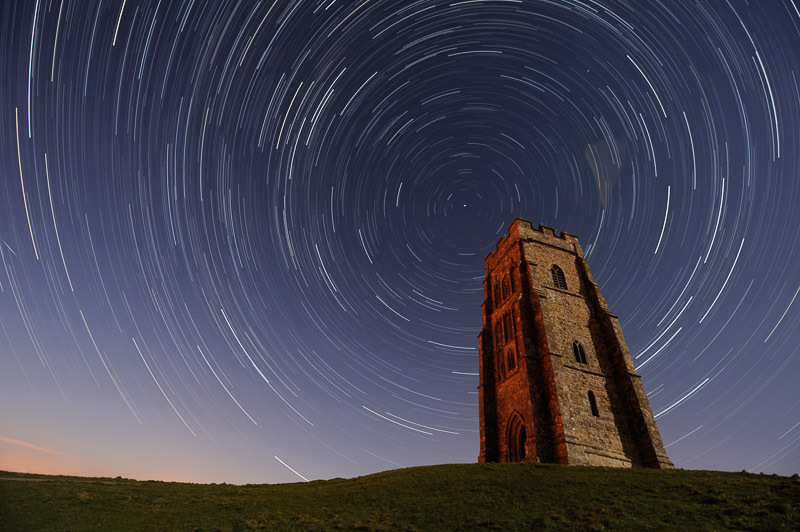 An hour long exposure of Glastonbury Tor, Somerset, showing star trails swirling in the sky above St Michael’s Tower. Taking a completely different approach to photographing Glastonbury Tor, this is a much more dramatic, surreal picture. I often get asked how the effect in the sky was achieved as I guess most people assume it is a computer generated effect. The answer is that I spent a lot of time planning and trying out ideas before settling on a composition that would show St Michael’s tower appearing to be sucked into the sky. The circular lines in the sky are called star trails. They are achieved by allowing the camera to expose the picture over a length of time – in this case 1 hour and 20 minutes. During this time the earth’s movement causes the position of the stars to change, turning anti-clockwise around the pole star. This movement creates trails, mapping the movement of the stars through the night sky. I made this picture on a clear (and very cold) evening when the moon was full. The white light hitting the right side of the tower is moonlight. The orange light hitting the left face is light pollution from the town (you can also see light pollution lighting the clouds in the bottom left slightly). Glastonbury Tor with the rising sun visible through the tower’s archway. Purchase this photograph as a print. For a period during spring, at the right time in the morning the sun can be seen shining straight through the archway of St Michael’s Tower. I planned this image very carefully, working out when would be the best date range to try the picture. The sun needed to reach the right height at the right time to be positioned in the middle of the entrance to the tower. Luckily a window of clear skies coincided with the right time of year so I was able to successfully photograph my idea. Glastonbury Tor seen from Sharpham Nature Reserve. Purchase this photograph as a print. 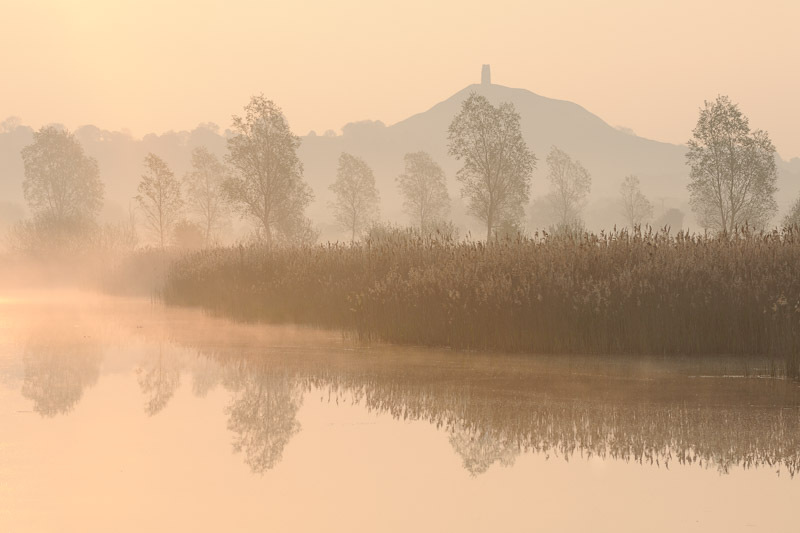 There are few views of Glastonbury Tor that combine reed beds and wetland habitats in such an ornate way. Sharpham Nature Reserve is one such place, yet it hasn’t been established all that long. I have pictures of this area taken not so long ago when it was still used for peat digging. Consequently the trees planted neatly in rows are still young and haven’t yet grown tall enough to break the outline of Glastonbury Tor. 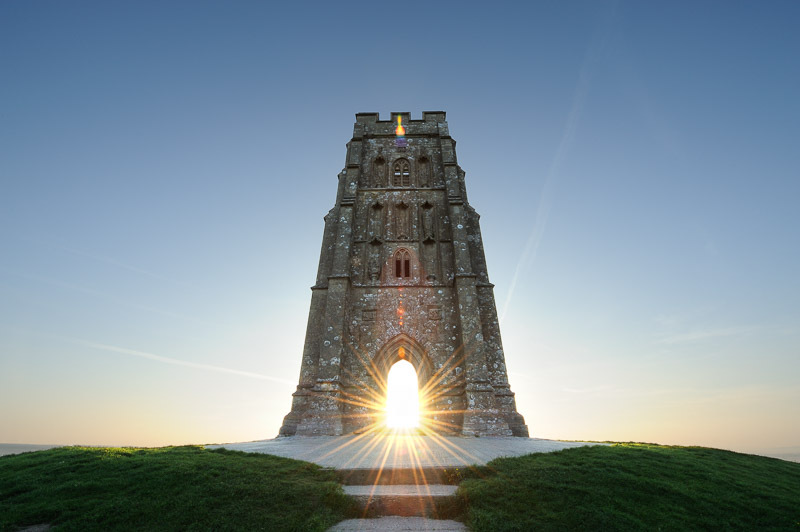 I hope you have enjoyed this short tour of my Glastonbury Tor photographs. If you happen to visit the area I highly recommend going to some of the places I’ve mentioned. All the better if you get there early and see some mist! That’s a great shot of the star trails. Was the shutter open all the time? Or was it a series of shots? Thanks Nev, it was a series of about 140 exposures of 30 seconds each, merged together using a star trail program. Hi Stephen – is there a way of predicting a good time to see the mists by checking the weather forecast the day before ? Hi Rose, Yes, it’s possible although it requires some practise. Have a read of my blog post here which talks about weather forecasts in general. There’s some info in there about mist and it contains links to useful forecasting sites.